Many things have been yelled my direction while cycling. It's part and parcel of what Bike Snob calls "the indignities of commuting by bicycle" and you get used to it. But atta boy? My mind begins to fill with scenarios from the old man's past that would make him sympathetic — no, enthusiastic — about seeing two wheels roll by. He was once a bicycle courier, battling cars and trolley tracks and cobblestone streets in 1930s Tacoma. Or maybe he was a board track racer in the waning years of the great six-days, for whom the sounds of chain and cog stir deep emotions. Then again, it's entirely possible he's just a guy who still remembers his first bike, baseball cards in the spokes, and that feeling of sweet freedom. To the old man... thanks for making my day. I did enjoy the ride. 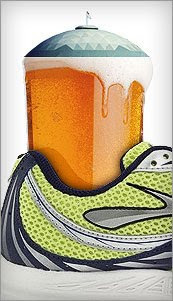 Join us for the inaugural run this Thursday (January 28), 5:30pm, at the Parkway Tavern! We'll do 3 miles at a "social pace" and end back at the P'way for a pint or two. If it works, we'll do it again next Thursday from a different watering hole. I'm resisting the urge to register a domain, get shirts printed, and start looking for investors... but I am very excited about the possibilities for this club. Come on out and be a part of it! If you have any questions, just drop 'em in the comments. Please also comment if you've got ideas about what makes a good running club, as I have no idea what the hell I'm doing. UPDATE: Join the new Facebook group for news and info on future runs. When cancer enters our lives, we often speak of it as a fight. And while that analogy is a little bristly for some, it makes sense to me. Cancer is a battle, and those of us who intend to win will look for any advantage. Navigating Cancer, where a good friend of mine is Community Manager, looks to be a great tool to have in our corner. The site provides a set of practical, empowering tools... a way for patients to organize their cancer journey along with their supporters and care teams. It also offers a strong community of support groups... facilitating discussions and the sharing of experiences, recommendations, and guidance. This free, easy-to-use site is currently in beta and will only continue to get better as people join, engage, and provide feedback. Check it out and see if it might make a difference in your fight. We all know how hard it can be to drop everything, change into our workout skivvies, and head out for a run. Add a little rain, wind, ice, and darkness to the mix and the chances of getting out the door become even slimmer. Wouldn't it just be easier to crack a cold one and watch some Biggest Loser? Well, sure. But then the fitness we've worked so hard to gain during the warmer months would go right out the window. Here's how I'm staying motivated this winter, and how you can, too..
1) Set a Goal for Spring - Decide to do something big by May, and commit to it. Your goal should be concrete and measurable. "Get faster" and "lose some weight" do not count, because they leave too much wiggle room in the training plan you'll create in Step 2. My goal is the Eugene Marathon. But I won't just train to complete the race, I'll train to PR and break 3 hours. See... concrete, measurable. If you can commit to your goal financially, do it. Register for that race, reserve a hotel room, do it now. Make your goal real and impossible to ignore. 2) Create a Plan and Keep a Journal - Now that you've got a goal, it's time to work backward from that date to today. What weekly mileage will you need to be running and how can you build to it safely? 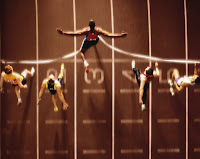 Do you need to incorporate track work or cross-training? I like to plan at least one month out using a simple online spreadsheet, which also serves as my log. Check it out. Whether you do it online or on paper, a plan and a journal will map baby steps to your goal, and keep you honest. 3) Reward Yourself for Success - It's important to celebrate small victories. Didn't miss a workout all week? Crack a cold one and watch some Biggest Loser! Reached a new milestone in your weekly long run? Buy yourself some cushy new running socks! And think about how you'll reward yourself in May, too. I'll probably continue my marathon tradition of a bloody mary and a bacon cheeseburger. 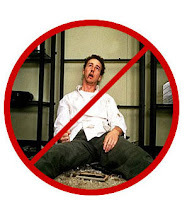 4) Allow Yourself Some Missteps - The purpose of a goal, plan, and journal is not to intimidate. It's a system of checks and balances. So don't beat yourself up over a missed workout or a day when you couldn't run as far as you planned. In fact, it can be kind of liberating to write in your log, "Was supposed to do 800-meter repeats, but decided it was a good day to hang out in my pajamas, read the newspaper, and eat pizza rolls" (just don't do that too often). 5) Embrace the Season - Winter is a great time to train! The cooler weather allows us to run farther and faster without overheating. I know some folks move inside at the first sign of rain, but I say get off the treadmill, put on a jacket, and get outside. Stick out your tongue and catch snowflakes. Don't step around puddles, stomp through them. Toughen up, Sally. Embrace the winterness... run like a little kid! 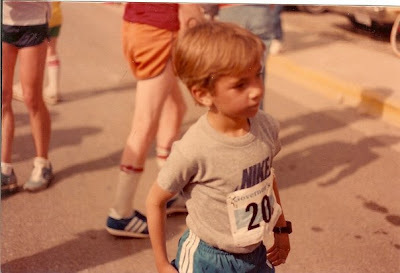 I have such fond memories of the Governor's Cup 5K, a race I ran every year as a youngster in my Montana hometown. This one, probably circa 1980 or '81, would have followed a predictable strategy... go like a bat outta heckfire at the gun, eventually settle into a comfortable jog, and then kick like a stubborn mule the last 200 yards into the finish chute. Man I loved the kick. Those last steps, with a crowd imagined to be something on the order of a million, transformed this little kid into a giant. It's been almost a year now that we've been doing this. You'll recall it started as a low-key affair — half-hour romps at lunchtime and then we'd go our separate ways. No commitment, no expectations. "Let's not get too serious," you said. And I agreed, mostly. But there was a part of me that knew... soon there'd be no looking back. Co-workers started noticing that I was stepping out every day and coming back exhausted, with a curious smile on my face. I began to let some of them in on the secret — about the simple joy you and I had found together. And now I know a couple of them have found their own mistresses. And they come back from lunch with the same smile. None of this was real, though, until I told my wife. I said it out loud one night, without even thinking. The words instantly echoed in my own head and it became cemented forever.